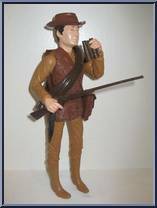 Body: Carmel, closed hands, same head sculpt as Daniel Boone, body sculpt of Sheriff Garrett. Accessories: Soft medium brown, hard dark brown. Contribute pictures, update details or suggest corrections for Bill Buck. Write a review about Bill Buck.